Storm Shadow can trace his family history through thirty generations of assassins. He can scale sheer walls with bare hands and feet, move with blinding speed, and endure unspeakable hardship and pain. Qualified expert: Long bow, Samurai sword; Throwing stars; Nunchaku sticks; 8th degree black belt in five martial arts. "The great Ninja assassin clans disappeared a hundred years ago. If they were wiped out, nobody took the credit for it and if they're still around-who are they working for?" 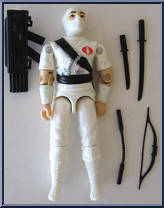 Contribute pictures, update details or suggest corrections for Storm Shadow. Write a review about Storm Shadow.